Columbia, Ill– Warrants outlining the chilling moments during the discovery of the bodies of Sheri Coleman, 31, her sons Garett 11, and Gavin 9, were unsealed today. Two letters containing threatening remarks that were sent to the Coleman home, were also released. The search warrants were unsealed on a judges order in response to a Belleville News-Democrat request filed last week in Monroe County Circuit Court. According to the court documents, contained within a report by Columbia Police Sgt. Jason Donjon, the first threat letter sent to the Coleman home, arrived January 1, 2009. The letter, dated Jan. 1, referred to someone traveling to Asia, but doesn’t refer to anyone by name. Sheri Coleman participated in missionary trips to southeast Asia, including Cambodia. “Have a good time in India (expletive)!” the letter concluded. The letter referred to an unnamed woman. “After searching the first level of the house and finding no one, we went upstairs to the second story. … As I walked up the stairs, I looked to my left and saw a white female, lying on her stomach,” Detective Justin Barlow wrote. Barlow found the body of Sheri Coleman naked, and face down. The officer said he tried to determine whether Sheri Coleman was alive, and noticed that rigor mortis had set in, which usually occurs within two to three hours, according to experts. “I attempted to slightly roll her over in order to see her eyes and check for breathing. I noticed when I lifted her shoulder, her head and neck moved also. It appeared rigor mortis had set in. I noticed the skin of her chest and head appeared purple,” Barlow reported. Speaking on condition of anonymity, a source within the Investigative Team has confirmed to blinkoncrime that the orange twine, found by detectives at the western end of the Jefferson Barracks Bridge, as indicated in an affidavit filed by Detective Karla Heine, matches that of similar twine found on 4 hay bales in the rear of the Coleman home. Columbia, Ill– As announced exclusively this afternoon on blinkoncrime.com, sources inside the Major Case Squad confirmed that Chris Coleman, husband and father of murder victims Sheri, Garrett and Gavin Coleman, has been arrested and charged with the murders of his family. Coleman was arrested at his parents home in Chester, Illinois without incident. At press time, Coleman was being processed and prepped for his 3 hots and a cot. Columbia, Ill– Police Sources inside the Investigation of the murders of Sheri Coleman and her two sons, Garrett and Gavin Coleman, have confirmed to blinkoncrime.com that the arrest of the husband and father of the deceased, Christopher Coleman, is imminent. Following the earlier disbanding of the Major Crimes Division while the Columbia police awaited forensics based on the advice of the District Attorney, Major Connor is back at the Columbia Police Headquarters this afternoon rumored to be preparting for an impromptu press conference, announcing Coleman’s arrest. There are already news trucks parked outside the Columbia PD although no announcement has been made. Columbia, Ill– Is there a break in the case of murdered Coleman family members Sheri 31, Garrett 11, and Gavin 9? Adding to the previous evidence reported exclusively at blinkoncrime.com, sources have confirmed a glove, appearing to have red spray paint remnants on the index finger as well as “back spray” was found in the area of the highway, enroute to Chris Coleman’s Golds Gym. 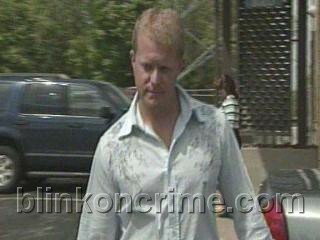 Speaking exclusively to blinkoncrime.com, a Police source inside the ongoing investigation has revealed there is more. The red spraypainted words scrawled in the downstairs of the Coleman home are NOT the only messages left by the murderer. The surveillance video expected to be in the recording device of the recently installed closed circuit camera is missing. Adding insult to injury in an already emotionally charged case, internal reports have the Monroe County DA’s office at odds with the Major Crimes Division over the decision NOT to file charges against Coleman prior to receipt of forensic results. Check back to blinkoncrime.com for further developments. Columbia, Ill– Chris Coleman, Father and husband to homicide victims Sheri 31, Garrett 11, and Gavin 9, has resigned from his position in security for Joyce Meyers Ministries without explanation. This incident is the latest report in a triple murder case that appears to be updating on the hour. A source close to Coleman’s family has told blinkoncrime.com that this latest action on behalf of the as-yet-unamed potential suspect in the case is due to a romantic hideaway property owned by Coleman’s employer that was the “love lair” of Coleman and his extramarital love interest. Blinkoncrime has withheld Coleman’s lover “Largos” true identity. I have learned this individual has been told not to speak to the media as she will be called as a material witness in the Grand Jury review on Coleman’s case. Attorneys for Coleman, Margulis & Margulis, have declined comment on behalf of their client. Coleman neighbors reports continue to surface. I received an earlier email that Coleman did NOT call the Police the morning that Chris Colemans’ family was slain. However, he DID phone the police officer across from his own home at his residence. (Editors Note: Seems like a good way to not be recorded). The alleged threats leading up to the murders he had reportedly been receiving however, were in fact reported directly to Police, unlike the wellness call. The Police Officer neighbor was first on the scene to discover the bodies. After a meeting with the District Attorney, detectives were told the State was not prepared to file charges without the forensic results from the scene, which can take weeks, against the suspect in the slayings. While detectives feel they know positively who is responsible for the deaths of Sheri, Garrett and Gavin Coleman, they have not named Chris Coleman publicly. Last Tuesday May 5, Police were called by Coleman to check on his family and discovered the grisly death scene. Speaking on condition of anonymity, a neighbor to the Colemans has confirmed detectives told them all three were strangled. The neighbor also told blinkoncrime.com that there was loud arguing at approximately 3 am coming from the home the morning of their deaths. When the coroner was removing the deceased mother and sons, there appeared to be messages scrawled on the inside walls with spraypaint. Within the last 30 minutes, Chris Coleman arrived at the gravesite where his wife, Sheri Weiss Coleman, and sons Garrett 11, and Gavin 9, will be laid to rest today. Their burial was postponed by court order to give Sheri’s family time to hold a memorial service in their honor over the weekend. Unmarked Police cars and several detectives have been following Coleman and his parents to their destinations since this morning. There are several police sources stating Coleman’s arrest is imminent and his attorneys, Margulis & Margulis, have requested in that event, their client be permitted to surrender. Recently, Chris Coleman filed employer reports that he had been threatened as a result of his work in security for Joyce Meyers ministries. Blinkoncrime has also received information that Coleman purchased additional life insurance policies on his wife in December 2008, following her removal of her name from the deed to their home.